"We hope to find more people alive," police official Alessandra Bucci said. "We should ask ourselves whether respecting these limits is more important than the safety of Italian citizens. Obviously for me, it is not," said Deputy Prime Minister Matteo Salvini, head of the right-wing League, which governs with the 5-Star Movement. Salvini also said he wanted the "names and surnames of those who are to blame, because a tragedy like this in 2018 is not acceptable." "They will have to pay, pay for everything, and pay a lot," he said. Aerial footage showed trucks and cars stranded on either side of the 80-metre long collapsed section of the Morandi Bridge, built on the A10 toll motorway in the late 1960s. One truck was shown just metres away from the broken end of what locals called their "Brooklyn Bridge". "Suddenly the bridge came down with everything it was carrying. It was really an apocalyptic scene, I couldn't believe my eyes." "People living in Genoa use this bridge twice a day," said Deputy Transport Minister Edoardo Rixi, who is from the city. "We can't live with infrastructure built in the 1950s and 1960s." Autostrade, a unit of the infrastructure group Atlantia <ATL.MI>, controlled by the Benetton family, manages the section of the toll highway that collapsed. "The collapse was unexpected and unpredictable. 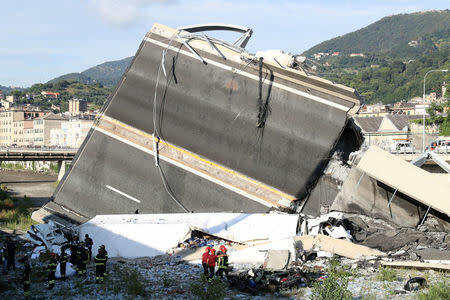 The bridge was constantly monitored and supervised well beyond what the law required," Stefano Marigliani, the Autostrade official responsible for the Genoa area, told Reuters. In a 2016 interview posted online, Antonio Brencich, a University of Genoa professor specialising in reinforced concrete construction, said: "This bridge is usually characterised as a masterpiece of engineering, but in reality it is a failure of engineering." The 1.2 km-long bridge was completed in 1967 and overhauled in 2016. The motorway it carries is a major artery from northern Italy's industrial centres to the Italian Riviera and to France's southern coast.